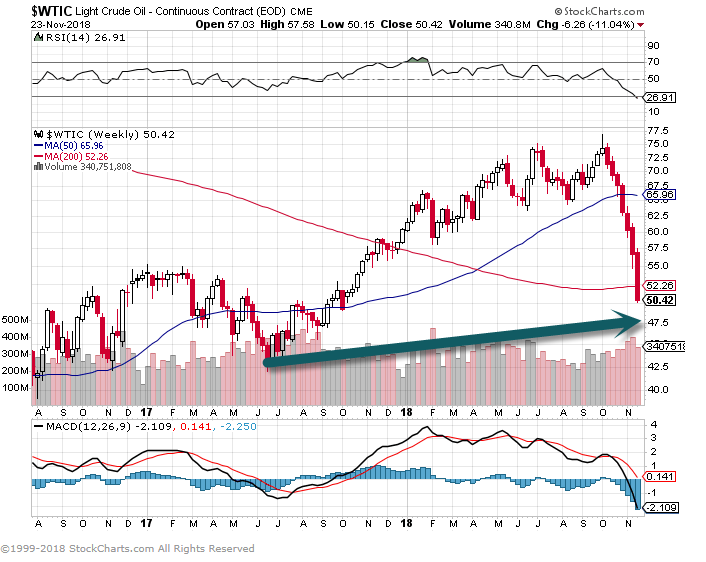 Up to Nov. correction crude was rising despite strong dollar. BEIJING, Nov 23 (Reuters) – China’s gasoline exports in October fell to their lowest in 13 months amid a glut of the fuel in Asia and globally, customs data showed on Friday. Gasoline exports last month were 650,000 tonnes, the lowest since September 2017 and 33 percent lower than a year ago, data from the General Administration of Customs showed. Stockpiles of gasoline have surged across Asia, with inventories in Singapore, the regional refining hub, rising to a three-month high while Japanese stockpiles also climbed last week. Inventories in the United States are about 7 percent higher than a year ago. Demand for middle distillates in Asia, however, remains strong, accounting for a surge in China’s diesel and kerosene exports last month. October diesel exports were 1.44 million tonnes, up nearly 40 percent from September and 19 percent higher than the 1.209 million tonnes a year earlier, the customs data showed. Exports of jet-kerosene rose to 1.19 million tonnes, up from September’s 990,000 tonnes and 970,000 tonnes in October 2017. China’s overall refined fuel exports in October rose 7.8 percent from a year earlier. The stronger overseas sales also followed the government issuing nearly 3 million tonnes of additional fuel export quotas in late October, more than half of which are for jet fuel. These new quotas — all to state oil firms — would take China’s total fuel export quotas to around 46 million tonnes, compared to 43 million for 2017, as refiners wanted to bolster domestic margins by thinning the supply pool amid an expanding surplus. Imports of liquefied natural gas (LNG) rose to 4.6 million tonnes last month, up from 4.37 million tonnes the previous month and 3.57 million tonnes a year earlier, ahead of the heating season when demand for the fuel rises, the customs data showed. 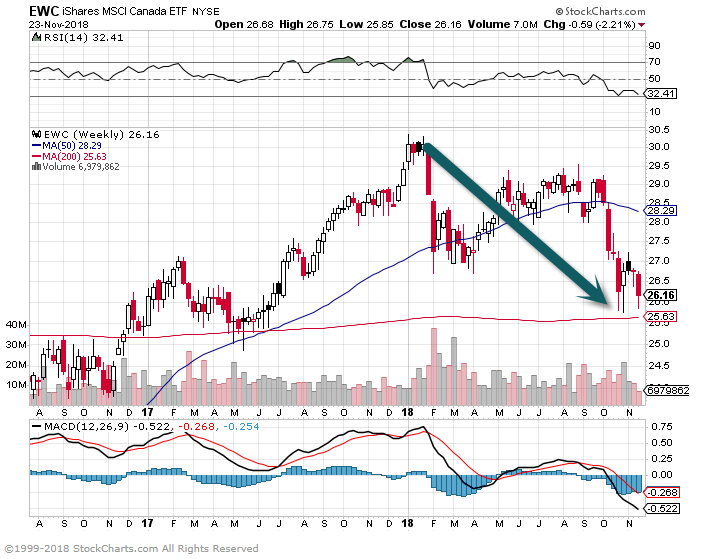 3.Commodity Currencies Following Crude Down. 4.Euro Rolls Over Again After PMI Data….Drop in Crude Oil Lowering Inflation Expectations Across the Globe. 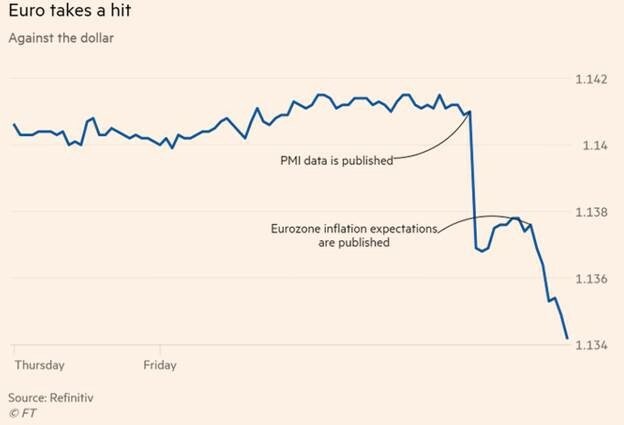 Dollar Rip weighs as well – The Euro getting hit after new PMI data showed that manufacturing output was stuttering in Europe’s two largest economies, FT says – Underlining the growing concern over the bloc’s economy, a measure of market-based inflation expectations dropped to its lowest level in more than a year following the release of the PMI data. 5.$1.3Billion Flowed into Low Volatility ETFs Last Week. 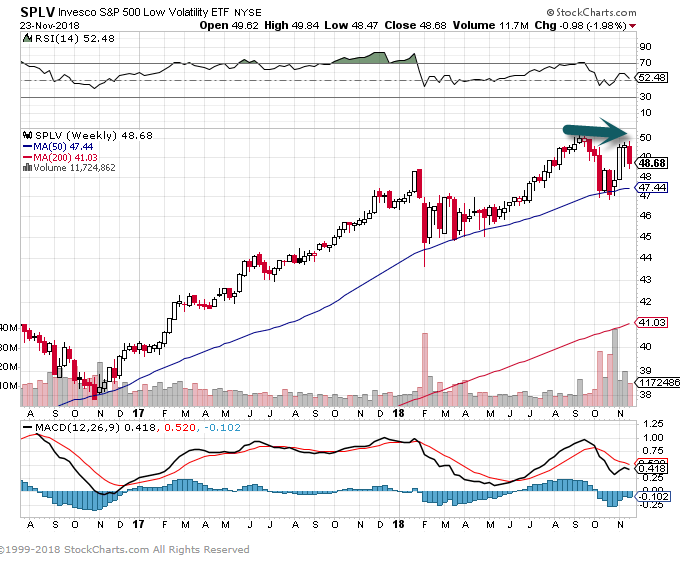 SPLV Low Vol ETF Approaching New Highs. 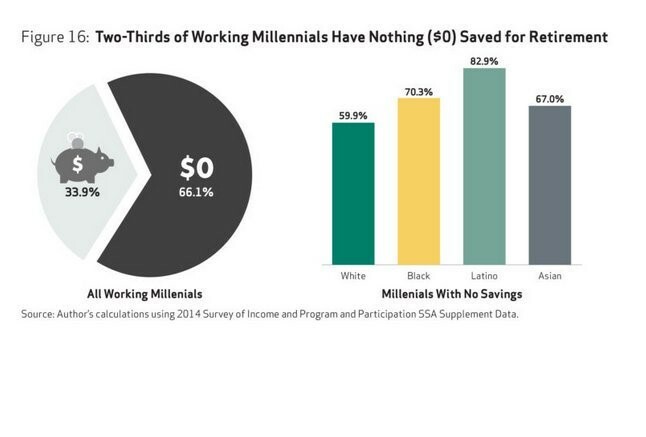 6.Two-Thirds of Working Millennials Have Nothing Saved for Retirement. 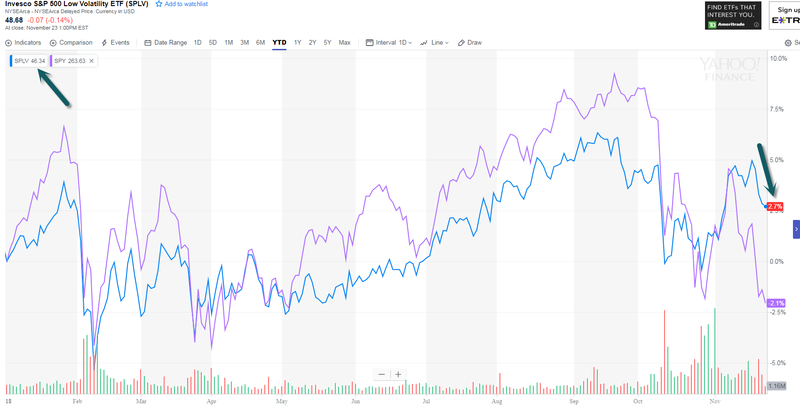 The numbers, on the surface, are stark: Just 13% of people working for Corporate America have a defined-benefit pension plan these days, down from 76% in the mid-1980s, according to data from the Bureau of Labor Statistics. 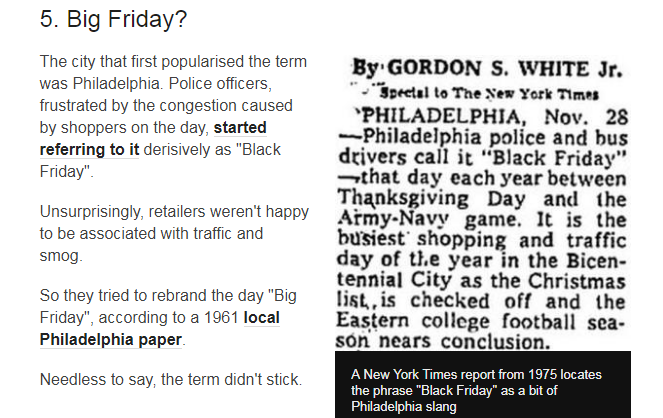 8.Black Friday on Track for Record Online Sales. Black Friday is gearing up to break records for cyberspending in the U.S. Firing up their payment cards, consumers by mid-morning had already spent $643 million, up nearly 28 percent last year, according to data compiled by Adobe Analytics. Ecommerce sales are on pace to match or exceed the $6.6 billion Americans spent in one day over the internet during “Cyber Monday” in 2017. Cold weather in the Northeast and rain and snow on the West Coast appeared to be convincing at least some consumers to skip stores and shop online, according to Mastercard, according to MasterCard SpendingPulse, which tracks all forms of payment. The strong start to the annual holiday shopping period reflects the solid economic growth seen in the U.S. this year, with unemployment at its lowest rate in nearly 50 years. The frenzied pace of shopping online has some popular products quickly selling out, with the Series 3 Apple Watch already unavailable at Target. Customers also took to social media to complain that Lululemon’s website had crashed on Thursday, leaving irate consumers unable to complete orders. The robust ecommerce traffic comes amid the deepest discounts of the holiday season on Friday, including a 33 percent average markdown on tablets, 22 percent discount on TVs and 16 percent reduction for computers, according to Adobe Analytics. Top-selling electronics this Black Friday include Samsung TVs, Dell Laptops and GoPro cameras, while Hot Wheels and Hatchibabies are among the hottest toys. So far, nearly 29 percent of consumers report already doing some Black Friday shopping, up slightly from last year, according to GlobalData Retail, which defines Black Friday as the four-day period starting on Thanksgiving. How much do we spend? 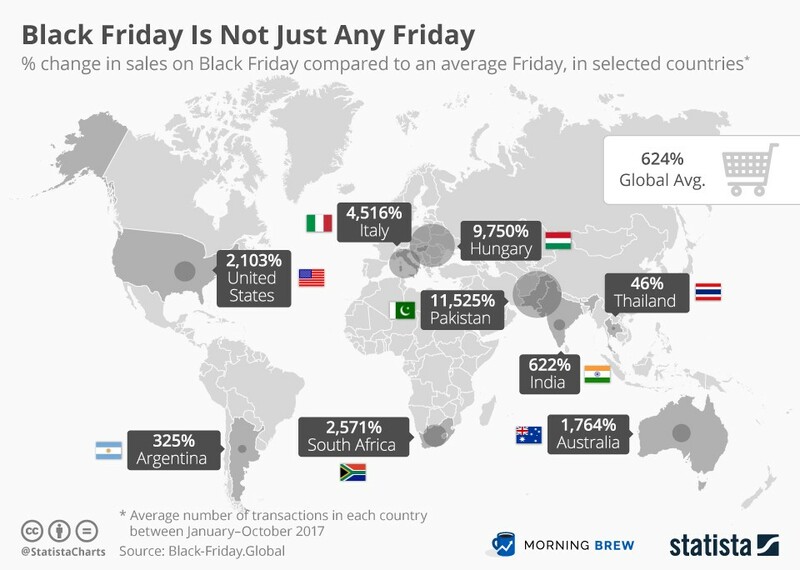 GlobalData projects total Black Friday spending will rise roughy 6 percent from last year, with total spending of around $60 billion. Spending online will increase 33 percent from 2017, the firm estimates. In another sign that bodes well for retailers, if not for consumers’ pocketbooks, holiday shoppers say they’ll spend an average of $420 during the holiday weekend, according to a recent survey from consulting firm Deloitte. Black Friday is expected to be the busiest shopping day of the year, according to retail analytics firm ShopperTrak. 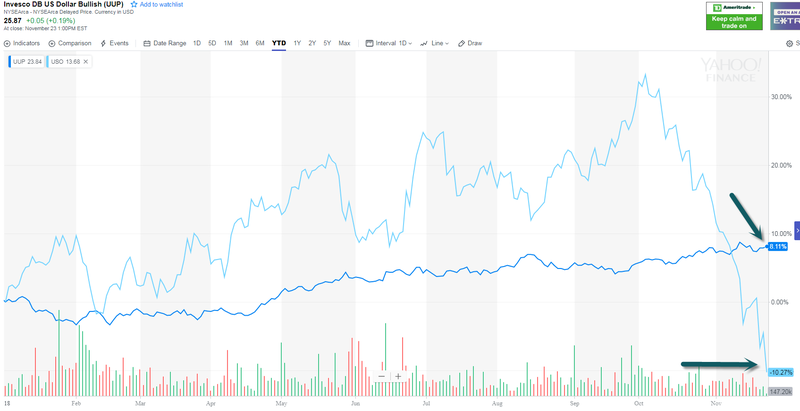 Analysts say Black Friday sales should be even bigger than a year ago, hitting $23 billion on Friday, up from $21 billion during the same year-ago period, according to MasterCard SpendingPulse. 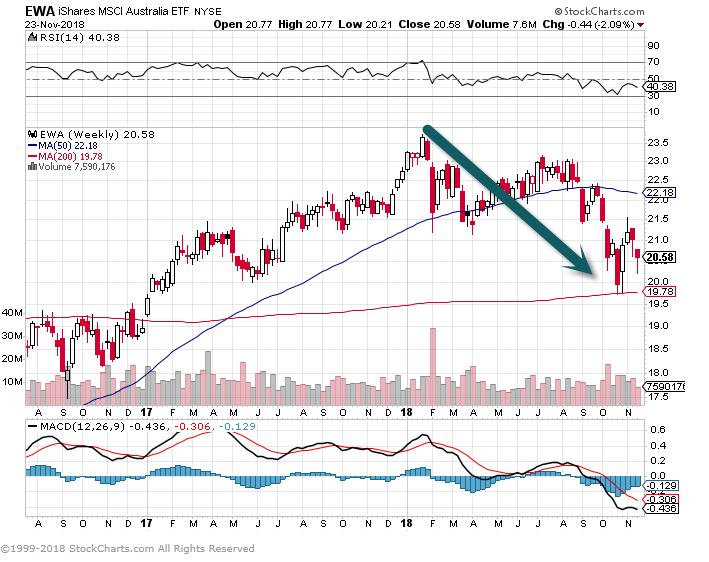 “We are off to an optimistic start but there is a long way to go,” said Marshal Cohen, chief industry adviser of the NPD Group, a market research firm. He noted that despite lines to get into stores Thursday night, there wasn’t a “mad dash” to buy. “The deals are available everywhere. They’ve been available for weeks,” Cohen said. 9.68% of Global Population Living in Cities by 2050. Today, 55% of the world’s population lives in urban areas, a proportion that is expected to increase to 68% by 2050. Projections show that urbanization, the gradual shift in residence of the human population from rural to urban areas, combined with the overall growth of the world’s population could add another 2.5 billion people to urban areas by 2050, with close to 90% of this increase taking place in Asia and Africa, according to a new United Nations data set launched today. The 2018 Revision of World Urbanization Prospects produced by the Population Division of the UN Department of Economic and Social Affairs (UN DESA) notes that future increases in the size of the world’s urban population are expected to be highly concentrated in just a few countries. Together, India, China and Nigeria will account for 35% of the projected growth of the world’s urban population between 2018 and 2050. By 2050, it is projected that India will have added 416 million urban dwellers, China 255 million and Nigeria 189 million. 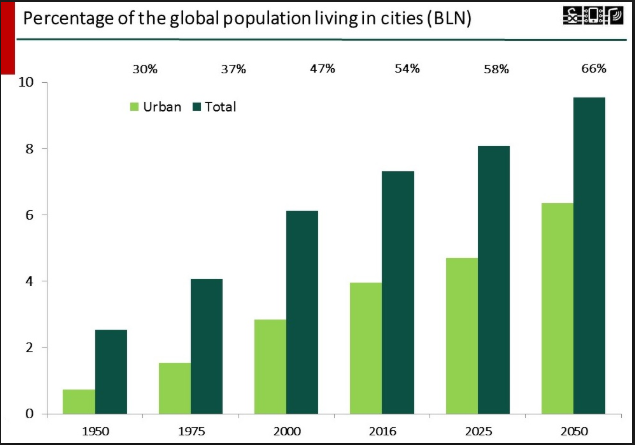 The urban population of the world has grown rapidly from 751 million in 1950 to 4.2 billion in 2018. Asia, despite its relatively lower level of urbanization, is home to 54% of the world’s urban population, followed by Europe and Africa with 13% each. Today, the most urbanized regions include Northern America (with 82% of its population living in urban areas in 2018), Latin America and the Caribbean (81%), Europe (74%) and Oceania (68%). The level of urbanization in Asia is now approximating 50%. In contrast, Africa remains mostly rural, with 43% of its population living in urban areas. Some cities have experienced population decline in recent years. Most of these are located in the low-fertility countries of Asia and Europe where overall population sizes are stagnant or declining. Economic contraction and natural disasters have also contributed to population losses in some cities. A few cities in Japan and the Republic of Korea (for example, Nagasaki and Busan) have experienced population decline between 2000 and 2018. Several cities in countries of Eastern Europe, such as Poland, Romania, the Russian Federation and Ukraine, have lost population since 2000 as well. In addition to low fertility, emigration has contributed to the lower population size in some of these cities. Globally, fewer cities are projected to see their populations decline from today until 2030, compared to what has occurred during the last two decades. The rural population of the world has grown slowly since 1950 and is expected to reach its peak in a few years. The global rural population is now close to 3.4 billion and is expected to rise slightly and then decline to 3.1 billion by 2050. Africa and Asia are home to nearly 90% of the world’s rural population in 2018. India has the largest rural population (893 million), followed by China (578 million). Tokyo is the world’s largest city with an agglomeration of 37 million inhabitants, followed by New Delhi with 29 million, Shanghai with 26 million, and Mexico City and São Paulo, each with around 22 million inhabitants. Today, Cairo, Mumbai, Beijing and Dhaka all have close to 20 million inhabitants. By 2020, Tokyo’s population is projected to begin to decline, while Delhi is projected to continue growing and to become the most populous city in the world around 2028. By 2030, the world is projected to have 43 megacities with more than 10 million inhabitants, most of them in developing regions. However, some of the fastest-growing urban agglomerations are cities with fewer than 1 million inhabitants, many of them located in Asia and Africa. While one in eight people live in 33 megacities worldwide, close to half of the world’s urban dwellers reside in much smaller settlements with fewer than 500,000 inhabitants. Understanding the key trends in urbanization likely to unfold over the coming years is crucial to the implementation of the 2030 Agenda for Sustainable Development, including efforts to forge a new framework of urban development. As the world continues to urbanize, sustainable development depends increasingly on the successful management of urban growth, especially in low-income and lower-middle-income countries where the pace of urbanization is projected to be the fastest. Many countries will face challenges in meeting the needs of their growing urban populations, including for housing, transportation, energy systems and other infrastructure, as well as for employment and basic services such as education and health care. Integrated policies to improve the lives of both urban and rural dwellers are needed, while strengthening the linkages between urban and rural areas, building on their existing economic, social and environmental ties. To ensure that the benefits of urbanization are fully shared and inclusive, policies to manage urban growth need to ensure access to infrastructure and social services for all, focusing on the needs of the urban poor and other vulnerable groups for housing, education, health care, decent work and a safe environment. The 2018 Revision of the World Urbanization Prospects is published by the Population Division of the United Nations Department of Economic and Social Affairs (UN DESA). It has been issued regularly since 1988 with revised estimates and projections of the urban and rural populations for all countries of the world, and of their major urban agglomerations. The muscles of older men and women who have exercised for decades are indistinguishable in many ways from those of healthy 25-year-olds. The muscles of older men and women who have exercised for decades are indistinguishable in many ways from those of healthy 25-year-olds, according to an uplifting new study of a group of active septuagenarians. These men and women also had much higher aerobic capacities than most people their age, the study showed, making them biologically about 30 years younger than their chronological ages, the study’s authors concluded. All of us are aging every second, of course, which leads many of us also to be deeply interested in what we can expect from our bodies and health as those seconds — and subsequent years and decades — mount. Worryingly, statistics and simple observation suggest that many elderly people experience frailty, illness and dependence. But science has not established whether and to what extent such physical decline is inevitable with age or if it is at least partially a byproduct of our modern lifestyles and perhaps amenable to change. There have been hints, though, that physical activity might alter how we age. Recent studies have found that older athletes have healthier muscles, brains, immune systems and hearts than people of the same age who are sedentary. But many of these studies have concentrated on competitive masters athletes, not people who exercise recreationally, and few have included many women. So for the new study, which was published in August in the Journal of Applied Physiology, researchers at Ball State University in Muncie, Ind., decided to look at a distinctive set of older men and women. “We were very interested in people who had started exercising during the running and exercise booms of the 1970s,” says Scott Trappe, the director of the Human Performance Laboratory at Ball State and the new study’s senior author. That era, bookended to some extent by the passage of Title IX in 1972 and the publication of “The Complete Book of Running” in 1977, introduced a generation of young men and women to recreational physical activity, Dr. Trappe says. “They took up exercise as a hobby,” he says. Some of them then maintained that hobby throughout the next 50 or so years, running, cycling, swimming or otherwise working out often, even if they rarely or never competed, he says. Those were the men and women, most now well into their 70s, he and his colleagues sought to study. Using local advertisements and other recruitment methods, they found 28 of them, including seven women, each of whom had been physically active for the past five decades. They also recruited a second group of age-matched older people who had not exercised during adulthood and a third group of active young people in their 20s. They brought everyone into the lab, tested their aerobic capacities and, using tissue samples, measured the number of capillaries and levels of certain enzymes in the muscles. High numbers for each indicate muscular health. The researchers focused on the cardiovascular system and muscles because they are believed inevitably to decline with age and the scientists had expected they would see what Dr. Trappe describes as a “hierarchical pattern” in differences between the groups. The young people, they thought, would possess the most robust muscles and aerobic capacities, with the lifelong exercisers being slightly weaker on both counts and the older non-exercisers punier still. Get the best of Well, with the latest on health, fitness and nutrition, delivered to your inbox every week. Instead, the muscles of the older exercisers resembled those of the young people, with as many capillaries and enzymes as theirs, and far more than in the muscles of the sedentary elderly. The active elderly group did have lower aerobic capacities than the young people, but their capacities were about 40 percent higher than those of their inactive peers. In fact, when the researchers compared the active older people’s aerobic capacities to those of established data about “normal” capacities at different ages, they calculated that the aged, active group had the cardiovascular health of people 30 years younger than themselves. Together, these findings about muscular and cardiovascular health in active older people suggest that what we now consider to be normal physical deterioration with aging “may not be normal or inevitable,” Dr. Trappe says. However, this study was cross-sectional, highlighting a single moment in people’s lives, and cannot tell us whether their exercise habits directly caused differences in health or if and how genes, income, diet and similar lifestyle factors contributed. It also did not look at muscle mass and other important measures of health or whether you can begin exercising late in life and benefit to the same extent. The researchers plan to explore some of these issues in future studies, Dr. Trappe says. But already the findings from this experiment suggest that exercise could help us “to build a reserve” of good health now that might enable us to slow or evade physical frailty later, Dr. Trappe says.